You often hear that PrestaShop is a good platform for an initial launch of an online business. Many online shops started with the open source version of PrestaShop. But what happens once the concept of the ecommerce is tested and the customer base and the product inventory begins growing rapidly? Do e-commerce owners keep running their site on PrestaShop or do they move on to other solutions? Here are the results of our analysis based on real data. We have conducted this study on a pool of 1 000 french online stores. We have analysed them over a 5 years period to see their evolution and we found surprising conclusions. #1 – 67% of PrestaShop online stores still exist after 5 years! This result is a big surprise for us. 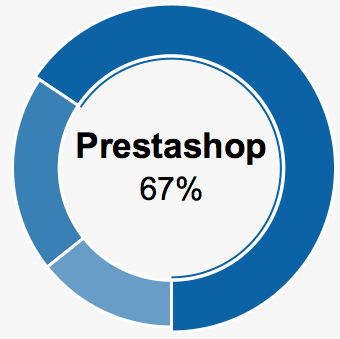 Despite rumours, PrestaShop shops survive over time and generate sustainable business for ⅔ of them. Customer satisfaction and commercial success: the main reason for not changing. A working business, able to scale with its growth, has no reason to migrate. Migration risk. 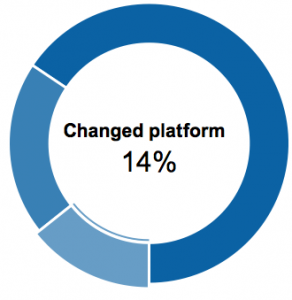 E-commerce owners (on all platforms) often talk about migrating to a new version, or re-platforming. But risks in terms of SEO and service continuity are very high, and the decision making to move on is only done in extreme scenarios. Limited growth. Some business are just not designed to scale, e.g. a family business with a very specific product positioning and a small target market. In those cases, the online part of the business generates some revenue, but not enough to justify any technical evolution. We will be able to dig into this by refining our results based on the product inventory size. This number might look very high, so let’s compare it to the national average for physical businesses. Reading statistics from the INSEE institute (http://www.insee.fr/fr/themes/detail.asp?ref_id=ir-sine2005&page=irweb/sine2005/dd/sine2005_natdevenir1.htm), the survival rate of companies within 3 years (data collected in 2005) is below 70%. 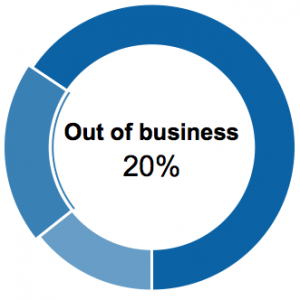 Therefore, 20% rate is higher than average! Some domain names still exists, while the company and the technological solution changed. A technology migration is hard to handle internally. Therefore, there is an external cost to be covered, way over the hosting and additional modules. As described in #1, associated risks (SEO, bugs, features adjustments…) are high for the e-merchant, making the decision making somewhat difficult. The timeframe of a migration project might be much longer than expected and the online business agenda does not allow to focus during a long period on non-critical tasks. We’ll be back soon with more data!